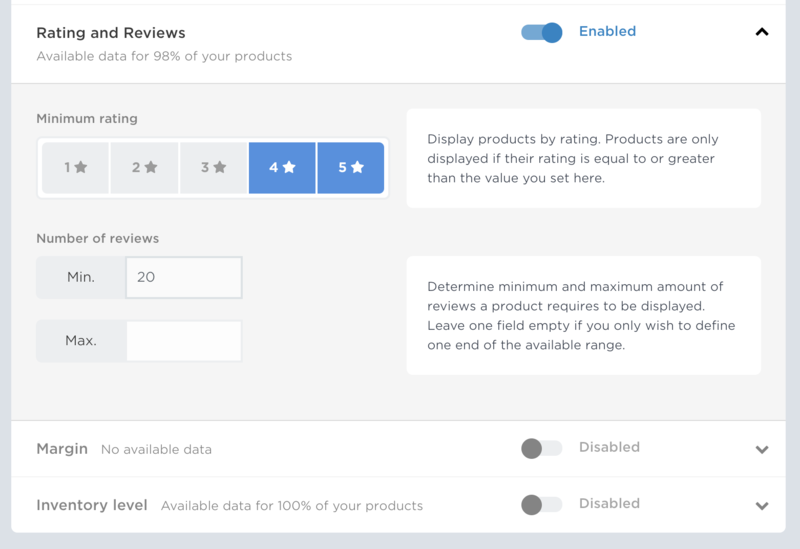 By integrating Yotpo with Nosto you will be able to show rating and review count in your personalized product recommendations from Nosto on design-template level. Additionally you will be able to filter products based on rating and number of reviews. This can for example be used to make sure low rated items or items with just a few reviews are never are recommended by Nosto. Once you've installed the Yotpo for Magento or Shopify extension, you'll need to follow their guide how to set up Rich Snippets. This differs a bit depending on your e-commerce platform, and you can find the guide for Magento 1 here, Magento 2 here and Shopify here. After this step, Nosto begins collecting the rating and review metadata automatically. There is no additional configuration required on Nosto's end to set up the integration. Enabling ratings and reviews in Nosto recommendations requires setting up and optionally designing recommendation templates to support ratings and reviews. For Yotpo Visual Marketing and user generated content (UGC), please read article here. $!product.reviewCount = Number of reviews collected. $!product.ratingValue = Rating. Value between 0.0 and 5.0. Create the actual stars using CSS based on the variables above for example by following this article. Navigate to the recommendations page and choose the recommendation element you wish to filter. 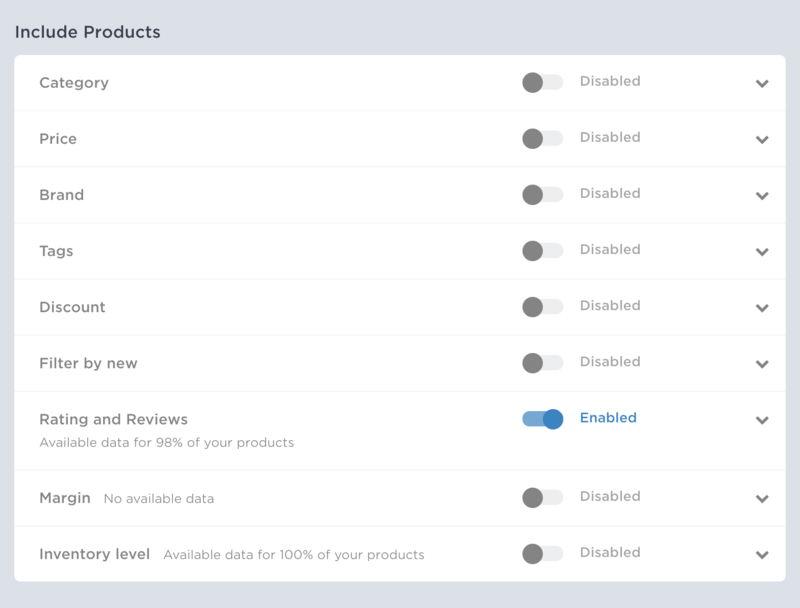 Choose ‘exclude and include products filtering’. Below the dropdown multiple filtering options appear.